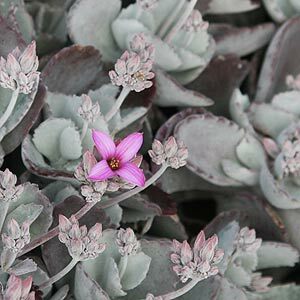 With wonderful silvery grey foliage and pretty pink flowers, Kalanchoe pumila (see picture right) is a an excellent choice for a hanging basket, container or as a ground cover plant in warmer climates. This species is from Madagascar and is relatively low growing to around 20cm. New foliage is a silvery grey turning to a deeper green as it ages, the edges of the foliage and lightly serrated or wavy often marked with red. Originally from Madagascar where it grows in very stony ground this is a plant that thrives on good drainage and sun. Kalanchoe pumila tends to ‘trail’ so a low hanging basket can be an excellent choice. As with most of the Kalanchoes, this species requires a well drained position in full sun to part shade. It is frost tender, so if you are in frost prone area, try growing in a container so that some protection can be given. You can prune the plant back to maintain a more bushy growth habit if required. The best time to prune is immediately after flowering which will be from spring to early summer.